Perhaps not as entertaining as Adam Savage’s dirty word list, our lists or indices have plenty of ‘purchase.’ Our lists focus on companies that offer energy alternatives to fossil fuels - solar, wind, geothermal and various biofuels. 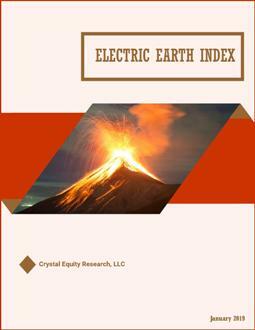 This post highlights the Electric Earth Index of companies tapped the kinetic powers of the earth itself - geothermal, tidal, wave, wind, and concentrating solar applications. The annual update of Crystal Equity Research’s Energy Alternatives indices has been completed. Merger, bankruptcies and just plain old ‘tossing in the towel’ actions took a number of companies out of our broadly defined sector of energy alternatives. Undeterred by start-up risks, entrepreneurs and inventors have been busy bringing new technologies and solutions to the market. The Energy Alternatives indices encompass over 750 public and private companies, all of which present interesting investment opportunities for the shrewd investor. The most significant change in the Geothermal Group is the deletion of US Geothermal following a friendly acquisition by Ormat Technologies (ORA: NYSE) in April 2018. We also added MijnWater BV to the geothermal group as a nod to its efforts to tap geothermal capacities in water trapped in reclaimed mines. There have been several changes in the Solar Concentrating Group. There has been no news of Solar Millenium AG going out of business as a designer of solar thermal power plants, but its website appears defunct, violating one of our criteria for inclusion in the list. No website and therefore less transparency, no inclusion on the lists. Concenrix Solar was gobbled up by France’s Soitec Group where you will find the latest news on its solar concentrating technologies. Clean Solar Energy Tower is no longer on board either, but only because the company long ago changed its name to Solar Wind Energy Tower (SWET: Nasdaq). The company began to describe its hybrid technology in terms of wind turbines rather than a concentrating solar application. We finally took the hint and Solar Wind is now included in the Wind Group. Naval Energies, the parent of OpenHydro, announced a decision mid-2018 to discontinue investments into the tidal stream energy developer. The company is reportedly under examination for bankruptcy in Ireland. The skies above appear to captivate the attention of many engineers. Ampyx Power and Kite Power are two relatively new entrants to the Wind Group. Both are private companies with novel alternatives to the conventional wind turbine perched on a tower. 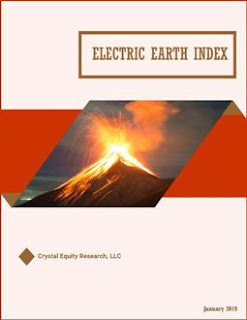 Visit the Crystal Equity Research website to view the updated Electric Earth Index. The last post highlighted changes in the Beach Boys Index. More in the coming posts on revisions to the other two indices: The Atomics and Mothers of Invention.